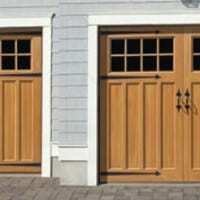 Now there’s a carriage door made from cellular vinyl with an extraordinary resemblance to natural wood. Introducing the Overture Series, an Artisan innovation that combines the low maintenance benefits of cellular vinyl together with the warm, rich aesthetics of wood. Overture’s embossed grain pattern, precision milling and wood-tone finish create pleasing texture and color that give it all of the allure of a wood carriage door.